Good news for the JA Brisk, JA Onepage, JA Mitius and JA Mero users, we have updated these templates to the latest T3v3 framework version 1.2.3 and now these templates supports the Offcanvas menu feature. This release also includes bug fixes. So, please check changelog for the bug fixes and upgrade to latest version. Backup before upgrading is a must. T3 Framework version 1.2.3 for Joomla 2.5 & 3.0 is now available with new feature, improvements and routine bug fixes. It includes support for Tag component, a new feature released with Joomla 3.1. Last week we updated and released k2 styles for 5 more templates including JA Anion, JA Social, JA Portfolio, JA Cloris and JA Ores. With this all the older templates missing the k2 styles are now updated. If you were using k2 component in your Joomla 1.5, you can safely migrate to Joomla 2.5 now. Meanwhile, please find details on the updates in each template changelog for more insights. T3 Framework version 1.2.2 for Joomla 2.5 & 3.0 is now available with improvements on the off-canvas menu, optimization of the ThemeMagic feature and lots of bug fixes. Details on these improvements and bug fixes are available in the changelog. JA Argo template for Joomla 3.0 and Joomla 2.5 is now stable and is available for download. It now includes the sourcefiles, themes layout and updated extensions. Please check the changelog and use compare files for checking difference and take due backup before upgrading incase you are using the beta version. JA T3 framework for Joomla 2.5 and 3.0 has a new improvement and bug fix release version 1.2.1. It's a routine improvement and new feature release which includes off-canvas menu improvement, optimized code with minify and menu fixes for iOS6 and much more, checkout the changelog for more details and as always do not forget to take backup before upgrading. One more Joomla! 3.0 compatible template - JA Travel version 2.5.4 is available for you to download. 3 templates: JA Rave version 2.5.3, JA Erio version 2.5.3 and JA Norite version 2.5.3 are upgraded to Joomla! 2.5.9. Those are also upgraded with K2 latest version 2.6.5 and a few bug fixes. Details on the upgrade can be read at each template’s changelog. Phew! 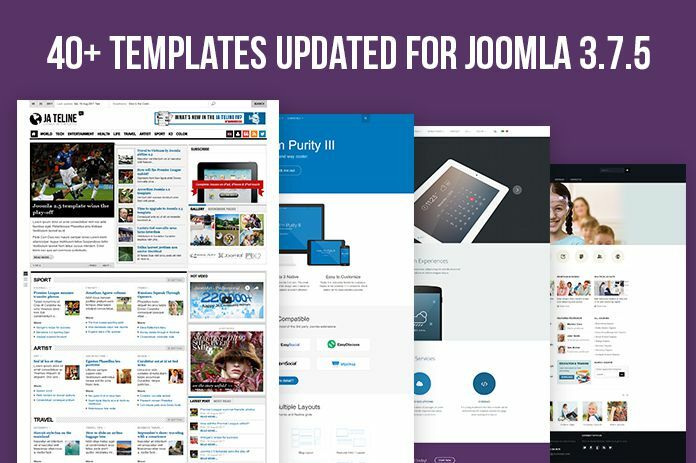 We have just upgraded 35 Joomla templates to be compatible with Joomla 2.5.9. Check those templates out now! They are now all ready to be installed. Your Wall is now ready for Joomla 3.0. We have also updated your Wall to be compatible with the latest K2 latest version 2.6.5 and a few bug fixes are included as well. Read the details on all the changes in its Changelog. As the result to the release of the recent T3 Framework v3 stable version 1.1.0; JA Brisk, JA Onepage and JA Mero have been updated accordingly. Mega Menu is now included (We know how long you guys have been waited for this feature to be included, so here you have it). Read more details at each template’s changelog. Please make sure to install your T3 Framework stable version from scratch following the guide posted in T3 Documentation section, then re-install your template from there. Update through JA Extensions Manager will not work in this case. Consider to do a back-up for your current template settings before proceeding to installation. Please discuss issues related with these updates in the respective forum of each template. For all Jomsocial lovers, the wait is now over. JA Social version 2.5.6 for Joomla 2.5 is now compatible with Jomsocial 2.8.3 together with the upgrade of JA Jomsocial Theme version 2.5.4. Details of the upgrade & bug fixes are listed under the Changelog. NOTE: Please do take due back-up of all your source files before upgrading the template. Please discuss issues related with these updates in the JA Social template forum. JA Mitius template for Joomla 3.0 and Joomla 2.5 is now stable and is available for download. It now includes thememagic support and responsive styles. Please check the changelog and use compare files for checking difference and take due backup before upgrading incase you are using the beta version.